On Monday, the United States of America turns 240 years old. In celebration of the freedoms and rights we assured ourselves by Brexiting before it was fashionable, many people across this nation will take advantage of their day off by, presumably and in no particular order, consuming equally astronomical amounts of beer and processed meat, wearing comically large, themed sunglasses indoors, firing off possibly illicit explosives, sporting the stars and stripes as poolside attire, getting into arguments over Wiffle ball and not once, not ever mentioning professional football’s relationship with CTE, all while blaring Rick Derringer’s “Real American”. Among these and the many other truths the writers and signers of the Declaration of Independence held to be self-evident in July 1776 lies the freedom to watch a cherished pastime in a live, nationally-televised broadcast. Though its life as a television spectacle started as a midsummer novelty, meant to alleviate the tedium of baseball highlight after ever-loving baseball highlight, the Nathan’s Hot Dog Eating Contest has quickly entered the lexicon of Great American Things™. On July 4, 1916, four immigrants held a hot dog eating contest at Nathan’s Famous stand on Coney Island to settle an argument about who was the most patriotic. A man by the name of Jim Mullen is said to have won, although accounts vary. In 2010, however, promoter Mortimer Matz admitted to having fabricated this legend with a man named Max Rosey in the early 1970s as part of a publicity stunt. Since 1978, people have made the pilgrimage, either to Coney Island, the very end of Brooklyn, itself, or to the chair in front of their televisions, in order to set their star-spangled eyes upon the sight of brave men and women ingesting far too many of Nathan’s beloved beef franks. As you can see, the contest had a modest beginning, with the average winning total only around 15.8 from 1972-2000. The biggest spike comes in 2001, which was the first appearance for Takeru Kobayashi. The man they call The Tsunami pushed the total from 25.125 (officially, 25 and an eighth) to a round 50, very nearly doubling the previous year’s total (a 99% growth, the largest in history) and setting several world records along the way. Again, Kobayashi’s rookie appearance in 2001 pushed hot dog eating in Brooklyn to a completely unprecedented level. From that point forward, the winning total never fell below 49, still almost double any previous winning amount. Remember that 15.8 average of winning hot dogs consumed through 2000? That number jumps to a positively gluttonous 58.02 for the years 2001-2015, or Post-Kobayashi (P.M.). Formerly lumped in with the veritable neanderthals, a women-exclusive competition began in 2011. Sonja Thomas reigned supreme for the first three editions of that, consuming 40, 45 and 36.75 hot dogs for 2011, 2012 and 2013, respectively. Also of note: the competition’s allotted time was reduced from twelve minutes to ten minutes in 2008 after a generally tenuous relationship with time limits at all previous to that. This allows for an interesting examination in efficiency. What we see above is the average number of hot dogs the winner consumed per minute, for the years when Wikipedia shows there was a time limit. Somewhat astoundingly, the first competition in 1973 saw the winner, Jason Schechter, knock out 14 dogs in three and a half minutes, good for an average of four dogs per minute. Between 1978 and 2001, that average never again rose above two per minute, and then, you guessed it – Kobayashi demolished that. 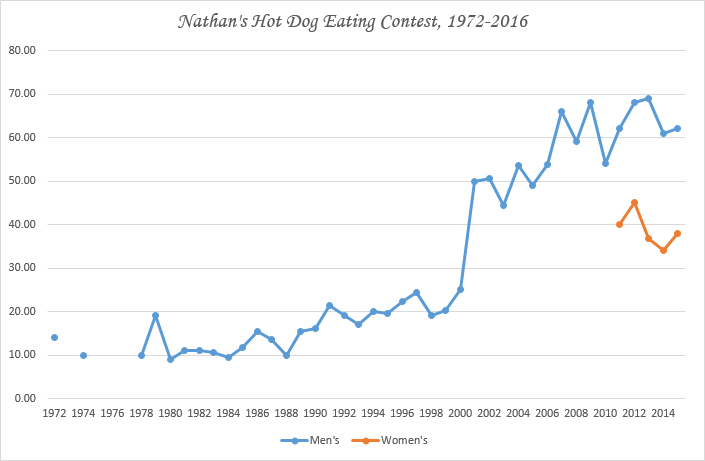 Since 2001, the average has risen pretty consistently, peaking in 2013 with Joey Chestnut‘s insane 69 hot dogs in ten minutes, good for a nice 6.9 dogs per minute. The women have proven no less formidable, submitting averages between 3.4 and 4.5 each year. 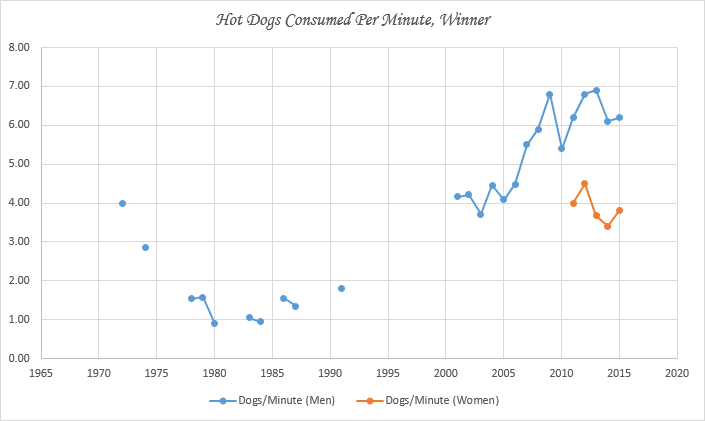 Finally, the advanced statistics for hot dog eating you never knew you needed. Here we see how the time limit reduction after 2007 affected eaters, who nevertheless continued to push themselves to far higher totals even without two spare minutes. 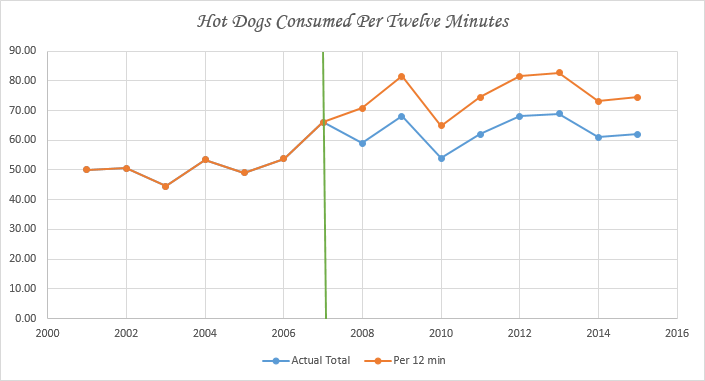 The blue line shows the actual winning total, while the orange line shows the expected number of hot dogs at the ten-minute rate had the competition occurred in twelve minutes. The line of thought would presumably be that eaters would welcome the two-minute reduction because it would mean that they wouldn’t have to prepare to eat as many hot dogs, but this has not been the case. After a fall from 66 to 59 from 2007 to 2008, the first year of the ten-minute limit, the winning total jumped to 68 in 2009 and hasn’t fallen below 62 since 2010. Even with that drop in 2008 and a subsequent dip to 54 in 2010, the average per twelve minutes hasn’t fallen below 64.8 since the time limit reduction. 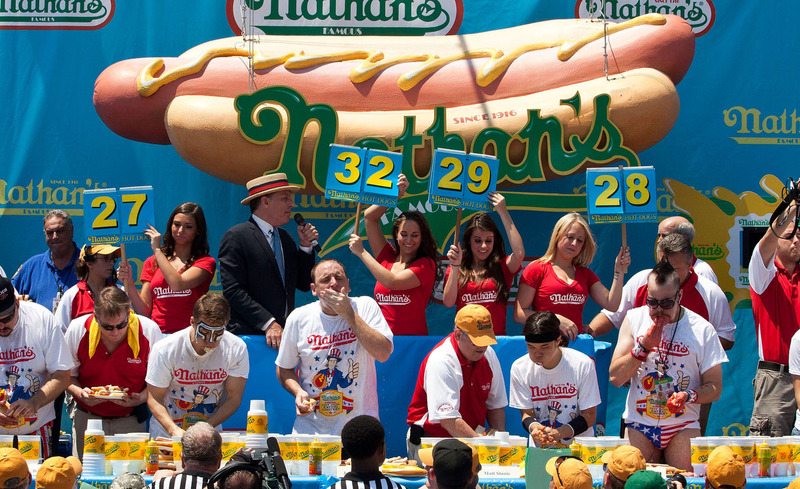 With 2013 being the banner, record-setting year, Joey Chestnut was on track for a stomach-annihilating 82.8 hot dogs had the competition been twelve minutes long. At that point, it isn’t even staggering; it’s full-on food coma-inducing, complete with a Nathan’s-sponsored ottoman and many patriotic disciples presumably waving large palmetto leaves in our hero’s face. 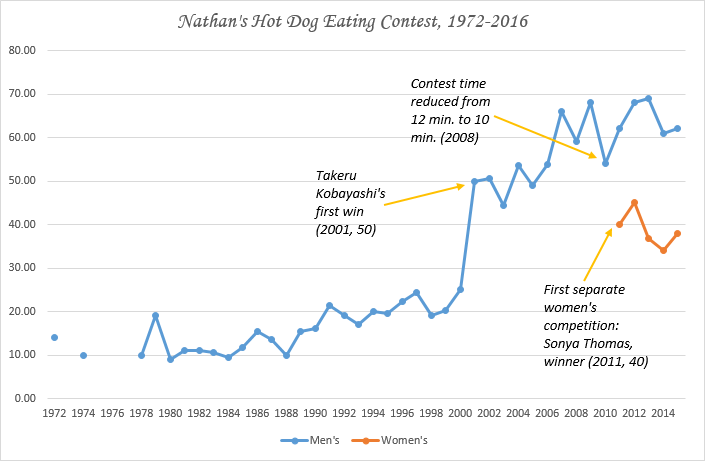 Whether the competition ups the ante again this year will be a good indicator of who may win: since Chestnut’s turn in 2013, Matt Stonie has won the competition two years in a row, but with 61 and 62 hot dogs in 2014 and ’15, good for averages of 6.1/6.2 and per-twelve averages of 73.2/74.4. Perhaps we’ve reached the peak of hot dog consumption, and the stabilizing force in competitive eating is the new tortoise. Like you, I’ll probably enjoy a dog or two, but it won’t push 70. Happy America, everybody. Buzzfeed did a video about this! It’s crazy how many hotdog’s people can eat! Yeah! It is disgusting, but amazing! Haha! I am fat and love a good dog and this still grosses me out. Good data and an interesting read! Who doesn’t love a good hot dog? 70 of them is…maaaaaaaybe a bit excessive, though. Thanks for reading and the feedback! You may be the first person to dig out quantitative evidence for an alien invasion of Coney Island starting from 2001. The rest of the world did not notice the real Y2K problem. And just when you thought the revolution would not be televised, here comes ESPN to reveal the truth. This town loves its processed meat products, that’s for certain. Thanks for reading! Done. Welcome to the party. Every time I go, it gets harder to leave. Thanks for reading! Indeed, he really put them down this year. Thanks for reading! I watched this event this year and nearly puked. but a very interesting read. It gets worse, or better, every time. Just wait until they push 100. Thanks for reading! haha! If they did ever get to 100, I’d have to turn the TV off. I could never do this. I have to savor every single bite. But congrats to them. Completely agreed. No Coney dog left behind, let alone 68 of them. Thanks for reading! Wow! I can’t believe they can eat so many hot dogs!